Using GPS will usually get you close, but make sure it is guiding you to Timber Lane. Sometimes GPS ends route guidance at our neighbor’s house. We are the second house on the left on Timber Lane. To avoid the climb over the mountains, take I-75 North from Atlanta, then I-575 North. This road turns into GA 5, and later GA 515. Stay on this road past Ellijay (where US 76 joins), past Blue Ridge (where GA 5 leaves), on to Blairsville. In Blairsville, turn right off the four-lane road at the US 19/129 intersection. Follow US 19/129 South with a couple of turns to the center of town. At the Town Square, turn right at Cabin Coffee and continue on US 19/129 South 2.6 miles to Town Creek School Road, just beyond the large yellow chair. Turn left, go 2.5 miles, and turn right on Timber Lane. Follow this road 0.2 miles, bearing to the left at the 143 green signpost down to our house. Take I-85 to I-985 to Gainesville. Take US 129 through Cleveland until intersection with US 19 (see below). Take GA 400 and US 19 North. Where GA 400 ends, follow US 19 and GA 60 to the left towards Dahlonega. At Dahlonega turn right just past the Texaco station, staying on US 19 and GA 60 (truck bypass). Continue on US 19, veering right at the split with GA 60, and turning left at the intersection with US 129. Continue on US 19 and US 129 up over the mountain, crossing the Appalachian Trail at the Walasi-Yi Center at the top. Continue down the mountain, past Vogel State Park, past GA 180 (left), past GA 180 (right). 1.6 miles after the GA 180 (right) intersection, turn right on Booger Hollow Road, just before the Valero station. Follow it 1.6 miles to its end at Town Creek School Road. Turn right, go 0.2 miles and turn right at the next road, Timber Lane. Our sign is just before the turn. Follow this road 0.2 miles, bearing left at the 143 sign down to our house. Take I-75 North. At Cleveland take US 64/74 West towards Murphy, a vary scenic drive into North Carolina. About 5 miles before you reach Murphy, turn right on US 19/129 towards Blairsville. When you cross GA 515, follow US 19/129 South with a couple of turns to the center of town. At the Town Square, turn right at the Chevron station and continue on US 19/129 South 2.6 miles to Town Creek School Road, just beyond the BP Gas Station. Turn left, go 2.5 miles, and turn right on Timber Lane. Follow this gravel road 0.2 miles, bearing left down to our house at the sign, 143 Timber Lane. Take I-40 West. Exit on US 23 South. Near Franklin, US 64 joins just before US 23 splits off. Continue on US 64 West towards Murphy. About 15 miles before Murphy, turn left on NC 69 South. After crossing into Georgia, turn right on US 76 West towards Young Harris and Blairsville. In Blairsville, turn left off the four-lane road at the US 19/129 intersection. Follow US 19/129 South with a couple of turns, to the center of town. 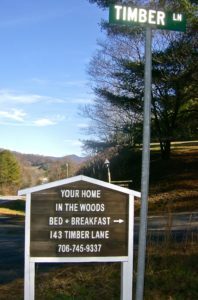 At the Town Square, turn right at the Cabin Coffee and continue on US 19/129 South 2.6 miles to Town Creek School Road, just beyond the large yellow chair. Turn left, go 2.5 miles, and turn right on Timber Lane. Follow this road 0.2 miles, bearing to the left at the 143 green signpost down to our house.